One of the most moving pieces in the classical repertoire, Tomaso Albinoni’s “Adagio in G minor” lies at the center of an historical mystery. Albinoni biographer Remo Giazotto claimed to have found a fragment of a manuscript by the famous 18th century composer in Dresden soon after the end of World War II. In 1958, Giazotto published a fully scored, complete articulation of the piece. However, when asked, he was not able to produce the purported original document, leading to speculation that his grandiose achievement was a hoax. The motivation for the trickery is obscure, but clearly a piece by a little known 20th century musicologist would have gotten far less attention than one by an established classical master. Whatever the truth of the matter, the adagio rose in popularity via a combination of performance in music halls and its use in movies. Beginning with its use in Alain Resnais’ Last Year at Marienbad (1961), the piece has come to signify melancholic suffering. In Peter Weir’s 1981 film Gallipoli, it orchestrates the horrid futility of World War I. The story of the Albinoni fakery crystallizes why I loathe the new film, Manchester by the Sea. Kenneth Lonergan’s film begins with an emotional magic trick, getting us to care about Lee (Casey Affleck), a handyman in working-class Massachusetts as he is unexpectedly asked to serve as the guardian of his. Midway through the film, a woman who works at a boat dock tells Lee she never wants to see him again. Because of the way the film is structured, we find her rude and cruel. However, it turns out she is completely right. In a wordless flashback, set to the entirety of the Albinoni adagio, used as an unrelenting emotional sledgehammer, we see that Lee is responsible for the death of his three young children. Having been drinking and doing cocaine with his friends, Lee stumbles out of the house in the middle of the night to walk to a convenience mart, only to return to the home engulfed in flames, the furnace having exploded. The use of the hyperbolic emotionality of the Albinoni music to replace words in this extended sequence is a hoax of a different kind. It obscures the fact that talking would allow us to articulate the absolute betrayal of fatherhood that Lee represents. Every moment of the film rings false: Lee’s estranged wife tries to get him to come out of his emotional shell, tending to him maternally. In real life, it simply would not happen that a mother would reconcile with the man responsible for the brutal deaths of her three children. 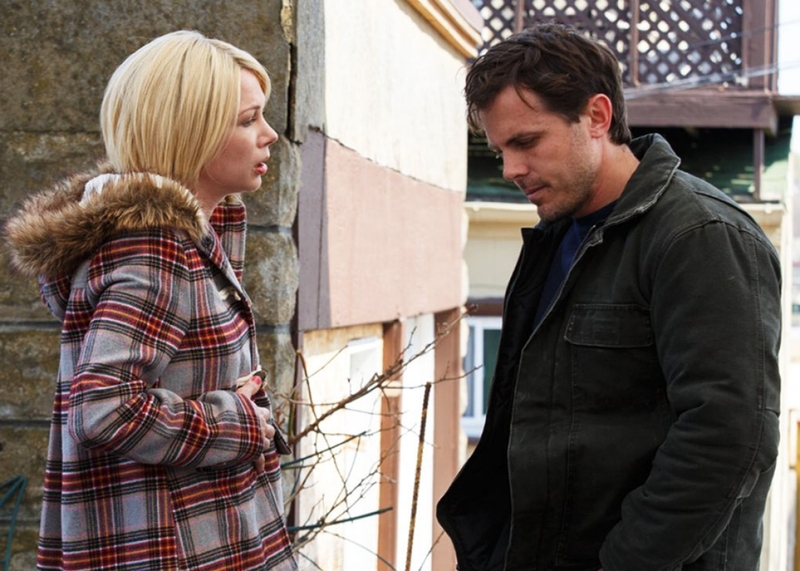 Manchester by the Sea proposes that we care about Lee because he is an authentic working-class man, a regular guy, a failed vision of traditional American masculinity that is as dangerous as it is patently false. The film’s fantasy leads to hideous outcomes, the most recent of which is the election of Donald Trump. 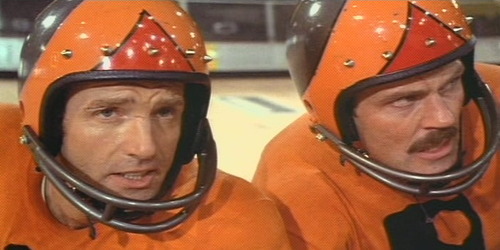 As an antidote, consider Andre Previn’s beautiful score for Rollerball (1975), another film about working-class masculinity. In Norman Jewison’s dystopia, Jonathan (James Caan) has risen to become the world’s most visible superstar athlete in a hyper-violent form of roller derby. This horrifies the corporate overlords who run the world; they designed the game as an opiate against individuality. Bartholomew (John Houseman), the owner of Jonathan’s team, engineers a series of rule changes designed to kill Jonathan in the game; his individual success has come to threaten the very foundations of the fascist corporate state’s control over its narcotized, sports-distracted population. At the film’s end, with every other competitor dead or maimed, Jonathan continues to play the game. He picks up the heavy metal ball and shoves it into the magnetic goal right in front of Bartholomew. The glass of a fake, corporate future shatters in Jonathan’s hands. The iron brutality of the film’s ending, set to the equally hyperbolic tune of Johann Sebastian Bach’s “Toccata and Fugure in D minor” functions contrapuntally to Previn’s subtle use the beautifully seductive, false Albinoni piece. In Rollerball, Giazotto’s music accompanies the narcotized world of luxury lived by Jonathan as the ward of an only seemingly beneficent State. The soaring emotion of the Albinoni adagio serves as a metonym: what seems to be true, that working-class male sports stars are televised as god-heroes, belies the actual enslavement of all individuals to a nefarious corporate collective. In Manchester by the Sea, the observe is true. Albinoni’s “Adagio for Strings” is used in earnest, and bludgeons the spectator in a false emotional echo chamber. Like the history of Giazotto’s purported rediscovery of the Albinoni masterpiece, the notes of Manchester by the Sea ring false.